Happy Saturday! I'm not going to lie, I'm incredibly glad it's the weekend. I plan to do nothing but eat and put up the the Christmas tree. And then eat some more. Last year it took me ages to get in the Christmas spirit but for some reason this year it's hit me with a bang (as you may have guessed from this post here). I've been listening to Michael Buble since mid November - no I'm not sorry... Although I think my neighbours might be - and I've already bought around half of my presents. THIS NEVER HAPPENS. I promised I wouldn't do the tree until the first so now that day has come I'm ready and raring to go. So we've gone from yesterday's very Parisian location to a very Parisian location AND a very Parisian outfit. I got this dress from Reformation (one of my all time favourite brands - if you haven't heard of them before then check 'um out) just before we left and was SO excited to take it out with me to wear. The wee shoes I also got from Zalando not long before I left, they really remind me of Chanel pumps but, y'know, without the hefty price tag. It was a little chilly so I ended up layering up with this big ole Nasty Gal jacket, which you might have seen already on me instagram, and a beret because I was having the most horrendous hair day ever. Honestly, I don't know how but I'd accidentally dried my hair so that the bit at the back was all combed forward like Donald Trump and it just wouldn't go back to normal... If anyone wants a tutorial on how to achieve this look then please don't hesitate to ask. 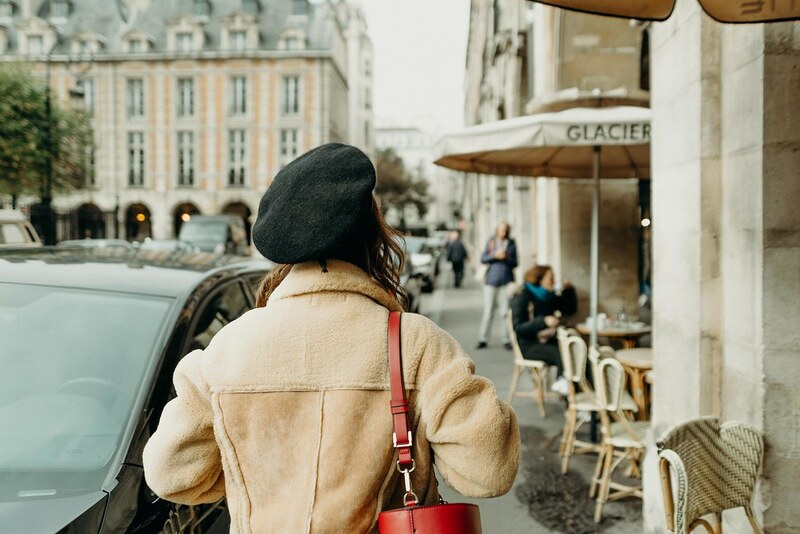 Ok, we're almost at the big old Paris guide which I'm so excited to share! And after that we'll whizz on over to my Iceland posts, all the while inching everrrr so slowly to Christmas. Feel free to read them with a mulled wine, I know I'll be writing them with one. This is the best Parisian look I've seen in ages, I swear! I love every piece of this. Enjoy putting up your tree! Girl, this dress is lovely on you - you're like a modern day Hepburn! You look gorgeous! I love that outfit.